Yes! Once the print is made, it will be shipped to our studio, where Tim will personally sign it in the white border on the lower right of the image before shipping on to you. If Tim is traveling, there could be a delay in getting you your print so please contact the studio if you are time sensitive. Metal prints are signed with a router that engraves Tim’s signature into the aluminum. It’s pretty cool! Do prints have a border? Yes, all prints on paper do. They are printed with a white border in proportion to the paper size. So for example, 15 x 10 inch prints have a one-inch border, while 36 x 24 inch prints have a three-inch border. Tim will sign the print in the white border. We currently offer some collections as metal prints only. These do not have a border. See below for more info. Are the prints ready to frame? 1) You can order just the print and mount and frame it yourself. 2) You can order the print with a Gatorfoam backing to make framing easier. With the proportional white border, the prints look nice with our without additional matting. We print on paper sizes that match readily available frames, so that custom framing isn’t necessary unless you want it. 3) If you choose the option of a Gatorfoam with mounting blocks no frame is needed! Your print will arrive ready to hang. 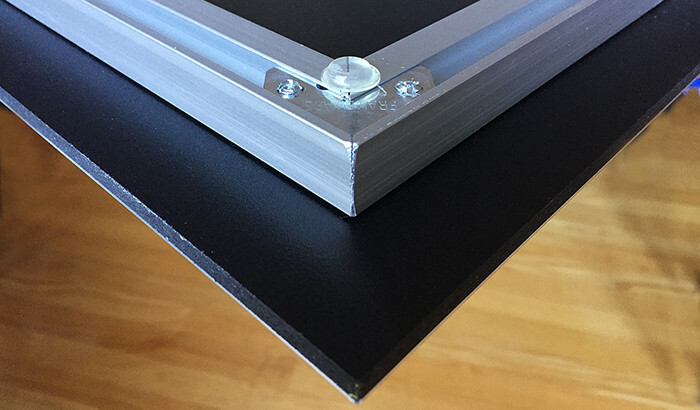 There are two Gatorfoam blocks mounted to the back to hang the print and make it float ½” off the wall. Simple, modern, easy. Below is the paper size, white border size and size of each photograph for prints on Lustre paper. 15 x 10" 1.25" 12.5 x 7.5"
18 x 12" 1.5" 15 x 9"
24 x 16" 2" 20 x 12"
30 x 20" 2.5" 25 x 15"
36 x 24" 3" 30 x 18"
I can’t find my favorite Tim Laman image in the gallery. Can I still order a print? Yes! Tim Laman’s Fine Art store is new in 2019, and we are gradually adding galleries. If there is a Tim Laman image you are interested in but don’t see in the art store, please don’t hesitate to email us at studio@timlaman.com. We are happy to arrange custom orders. Why are some galleries available only on aluminum? Tim has two gallery exhibitions in 2019 that are printed on aluminum (Birds of Sunnylands and Walden Pond). We want customers to be able to purchase the same product viewable in the galleries, so we currently offer these images printed on recycled aluminum using the dye sublimation process. This is a beautiful product. They are archival, fade resistant, and extremely durable. They are scratch resistant, and you can wash them with window cleaner. They come ready to hang and have a modern frameless look that fits into any room, and focuses attention on the image itself. They are perfect for public places. Any image in Tim’s collections can be ordered printed in this way as a custom order. Please contact the studio with inquiries. Tim Laman's “Walden Pond” and “Birds of Sunnylands” images are printed on recycled aluminum in a new cutting edge way. Dye-sublimation is used to infuse the photograph into the metal. The image is printed onto transfer paper, treated with pressure and temperatures over 380 degrees Fahrenheit, which turns the ink from a solid to a gas, then solidifies into the aluminum. The aluminum is fused to 1/4" black sintra to provide durability and thickness. It is then mounted to an aluminum float backing which has a lip for easy wall hanging. Your art will look like it is floating off the wall. We strive to provide you with a very clear picture of what you will be getting, with the ability to zoom into images, and features like Wall Preview, and even Live Preview AR throughout this store website. So we have to insist that sales are final. Exceptions are made of course for any damage during shipping. Please just contact the studio, and we will make arrangements for you to return the print for a replacement. Please sign up for Tim Laman’s newsletter to receive monthly updates on new work, stories from the field, and the latest additions to the gallery.